mbed is a platform for developing smart devices that are based on 32-bit ARM Cortex-M microcontrollers. It is designed to provide a highly productive solution for rapid prototyping and product development, with a focus on connected Internet of Things devices. It is a project developed by ARM, its technology partners and a community of core developers, and it is used by tens of thousands of professional developers to create intelligent products that take advantage of the power of modern microcontrollers and connectivity. (Source). The Freescale FRDM-KL25Z board is an ultra-low-cost development platform forKinetis L Series KL1x (KL14/15) and KL2x (KL24/25) MCUs built on ARM® Cortex™-M0+ processor. Features include easy access to MCU I/O, battery-ready, low-power operation, a standard-based form factor with expansion board options and a built-in debug interface for flash programming and run-control. 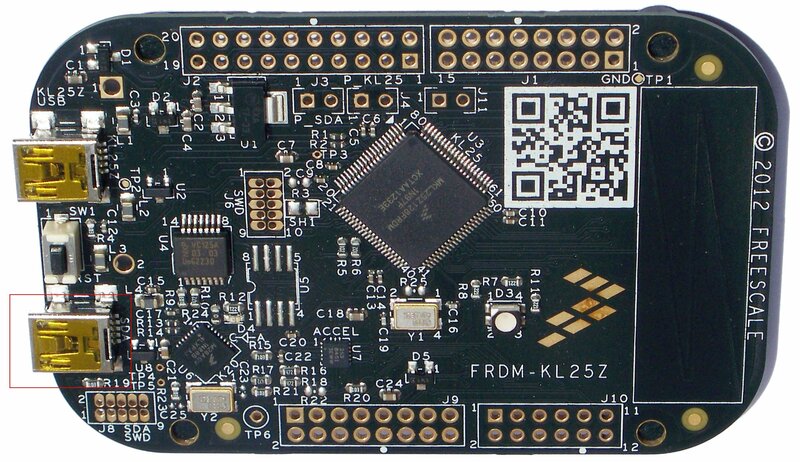 The FRDM-KL25Z is supported by a range of Freescale and third-party development software, including mbed platform. It is assumed from now on that you have a Freescale FRDM-KL25Z board and that it is already mbed-enabled. It is really simple to setup and program, and it is free, so let us get started! Use the USB lead to connect your KL25Z to a PC, using the USB connector labelled OpenSDA. The status light will come on, indicating it has power. After a few seconds of activity, the PC will recognise the mbed Microcontroller as a standard USB drive. Also your PC will detect that a driver is needed. After your PC detecting the FRDM-KL25Z board, it will invite you to install drivers, Choose the second option of Advanced installation of driver as shown. 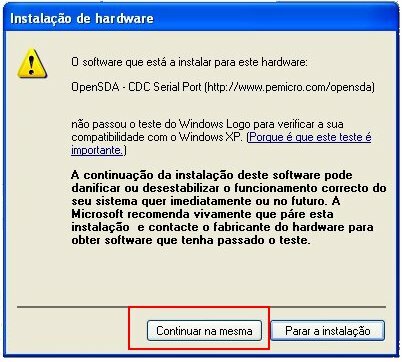 Note: This installation is under Windows XP in portuguese, your Windows will take you through similar procedures. Click Next and choose to find the driver (by this time most certainly FRDM-KL25Z is recognised as a drive). The required drivers are included in FRDM-KL25Z’s flash memory. Install the drivers, following all the normal steps of installation. 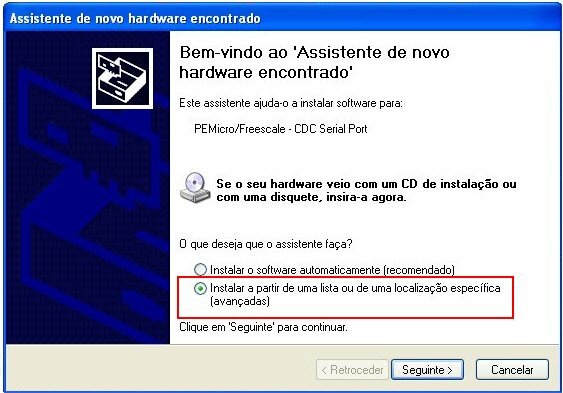 Install the drivers, following all the normal steps of installation. NOTE: You may be warned that the driver is not officially recognised to be compatible with Windows. You will need to accept it as trustworthy. If you do not have an mbed account, choose “Signup”, and create your mbed Account. Otherwise, log in with your normal username and password. Login will give you access to the website, tools, libraries and documentation. On top left of Home page you will see the menu where you will choose your platform by clicking on Platforms button. Now choose the right Platform that for this case is FRDM-KL25Z, by clicking on this option. Having chosen the Platform, you will now add your FRDM-KL25Z board to your Compiler. After adding the board to the Compiler you are ready to compile your first code. 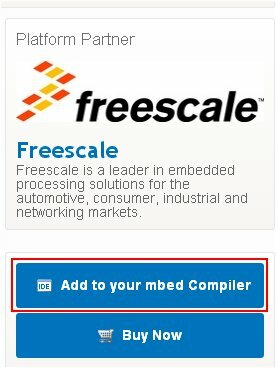 Open the online Compiler clicking the Compiler button in the site menu (top-right of the page). This will open the Compiler in a new tab or window. NOTE: It will be your chosen name that will appear as logged in, obviously! 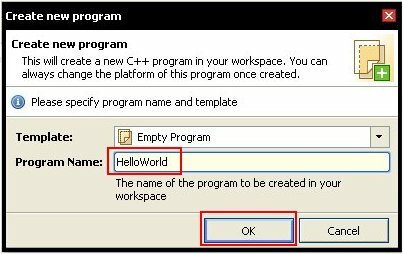 Add a new file by right clicking on HelloWorld program name. 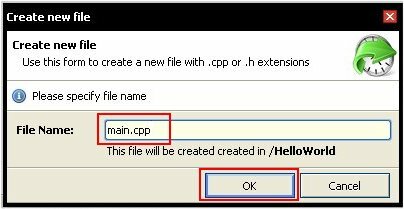 Enter the name of the new file main.cpp and click OK.
After adding new file, click on the main.cpp file in your new program, to open it in the file editor window. This is the main source code file in your program, and by default it is empty. Write the following program. 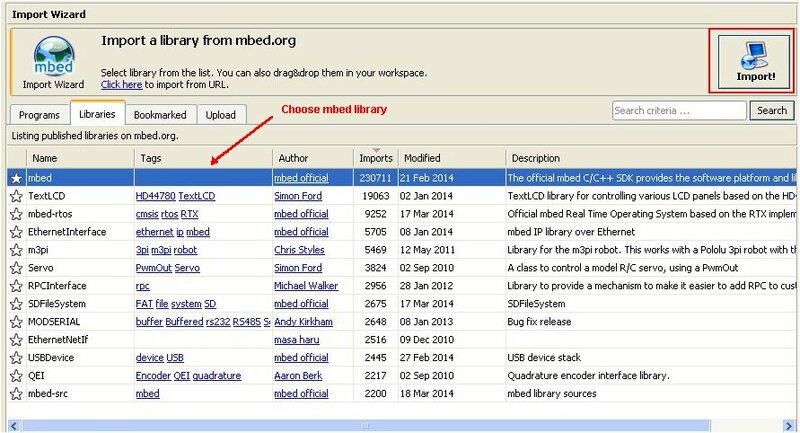 Now choose mbed library and then click on Import button on the top right-side. 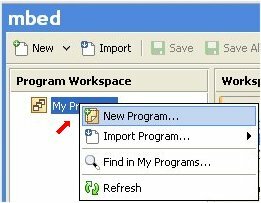 Program Workspace will show that mbed library has been added to HelloWorld program. In our main.cpp file LED1 stands for red colour LED on the FRDM-KL25Z. 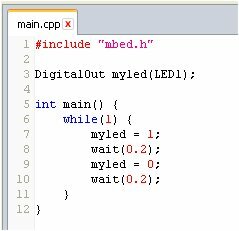 Before proceeding any further, make changes to second line at the end of DigitalOut command, substituting LED1 with LED3. On the right-side of editor you will see the Enumerator telling you that LED3 corresponds to blue LED on FRDM-KL25 RGB LED. To compile the program, click the Compile button in the top toolbar. This will compile all the program source code files within the program folder to create a binary program. After a successful compile, you will get a Success! message in the compiler output and the download dialog will pop up to Save the binary program, or it will be automatically downloaded to your default Downloads folder. Save it to the location of your PC in case of download dialog pop up. NOTE: In Goggle’s Chrome browser, the compiled file will be downloaded to Downloads folder. NOTE: If there are errors, they will show up in the “Compiler Output” window, and will need to be fixed! FRDM-KL25Z behaves a drive, so you find it in My Computer of your PC. 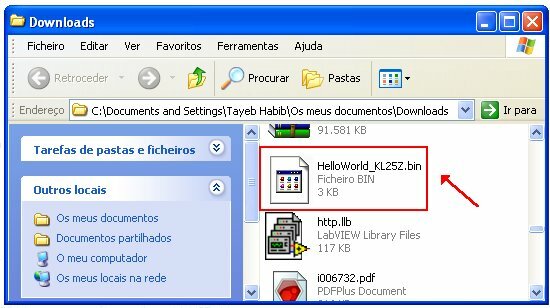 Cut, or drag, the HelloWorld_KL25Z.bin file in your PC’s Downloads folder and paste, or drop, in the mbed Microcontroller folder, wait a few seconds for the drive folder to close automatically, and then hit reset on the microcontroller to start it running! If everything goes well, FRDM-KL25Z is programmed and the blue LED on RGB LED on FRDM-KL25Z will blink! And an enormous wealth of information on mbed’s website! This entry was posted in Electronic Projects and tagged ARM, Arm Cortex, FRDM-KL25Z, Freescale, Getting Started, mbed, openSDA. Bookmark the permalink. No idea. It should not be that complicated.